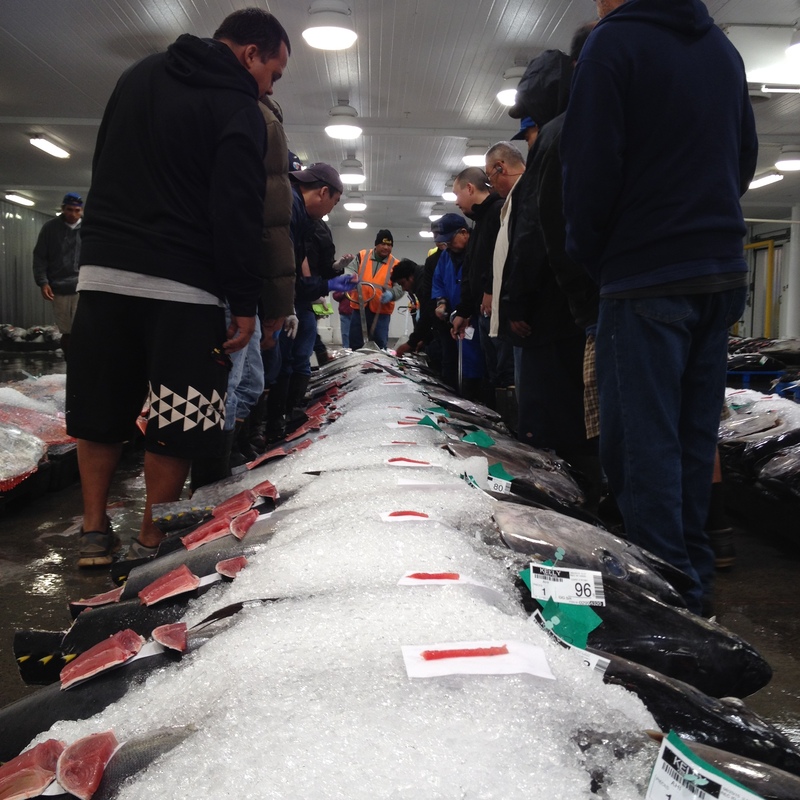 In the coldest room in Hawaii, it took just one minute and nineteen seconds for the 133.0 pound Tombo Ahi Tuna to sell for $9.20 a pound at 5:33 am on a crisp August morning. Before the end of the week, the $1,223.60 tuna will be eaten in a high-end restaurant in Waikiki Beach by tourists completely unaware of how the fish got to their plate. 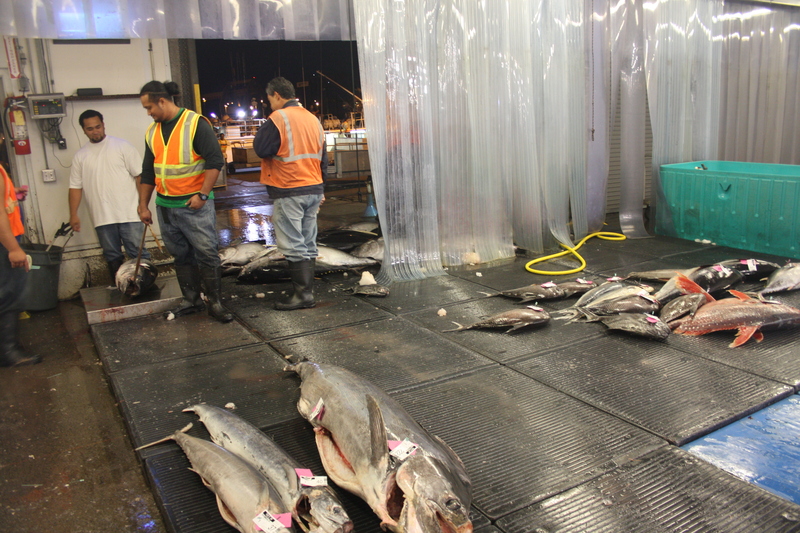 As most tourists are going to bed, Hawaiian fish processors stroll towards Pier 38 in Honolulu. The ink black Honolulu Harbor contrasts the bright lights of Waikiki Beach high-rise buildings in the distance. Despite the early hour and lack of light, one can clearly hear the sounds of people hard at work. 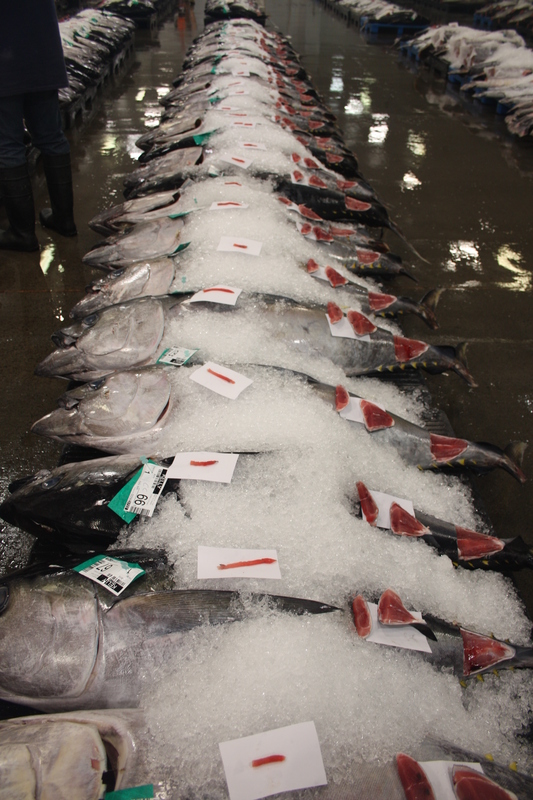 Ropes zip quickly through the eyes of blocks and tackles, XtraTuf rubber boots crunch freshly spilled ice on concrete slabs, and a hacksaw rhythmically rips through the spinal column of a 200 pound swordfish, all in preparation for the last big tuna auction remaining in the United States. 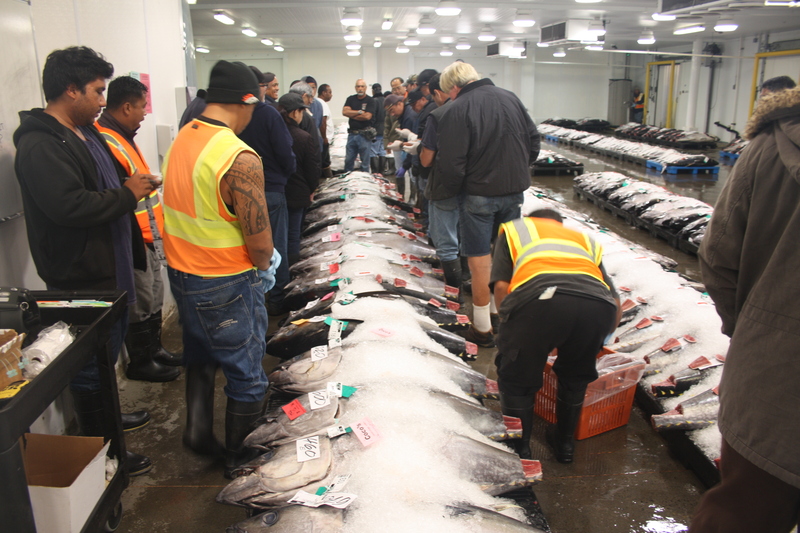 The Honolulu Fish Auction takes place six days a week. 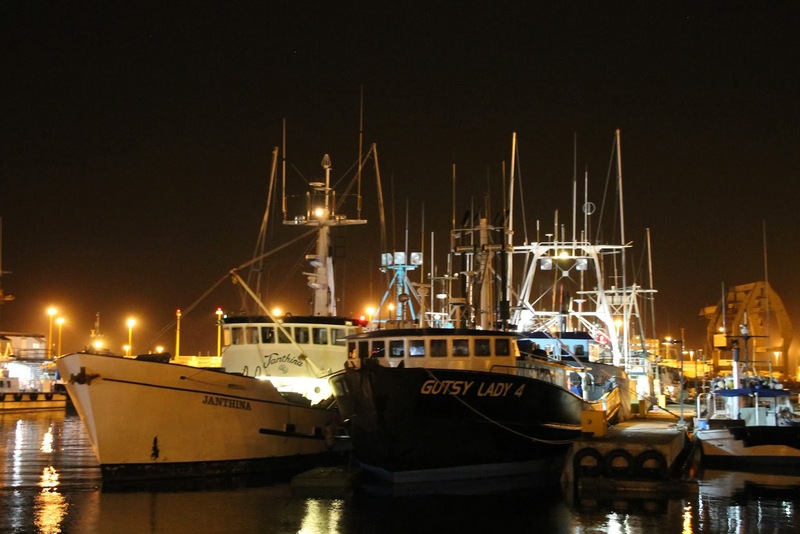 In preparation, large fishing vessels pull up to the pier at 1:00am and offload their bounty. 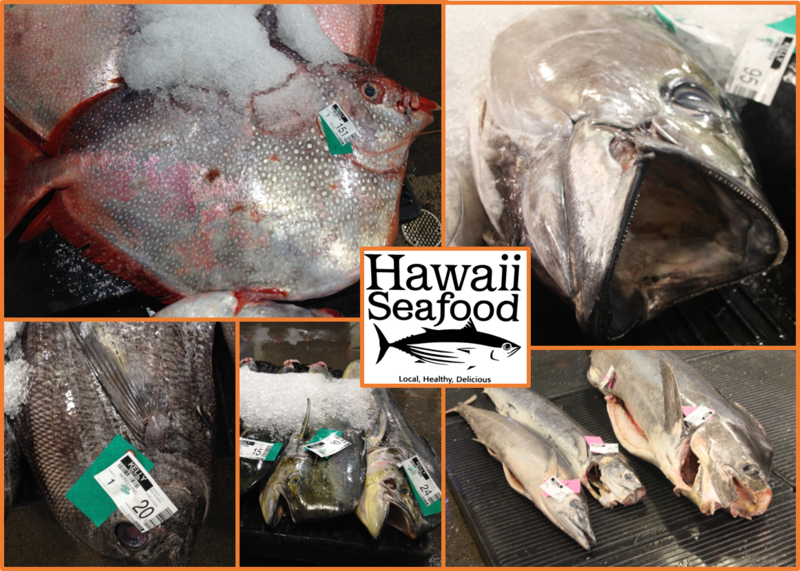 The catch includes all the typical fish found on a Hawaiian menu, including Tombo Ahi, Mahi, Opah, Shutome, Monchong, Walu, Ono, and more (Tuna, Mahi Mahi, Moonfish, Swordfish, Pomfret, Escolar, and Wahoo, respectively). 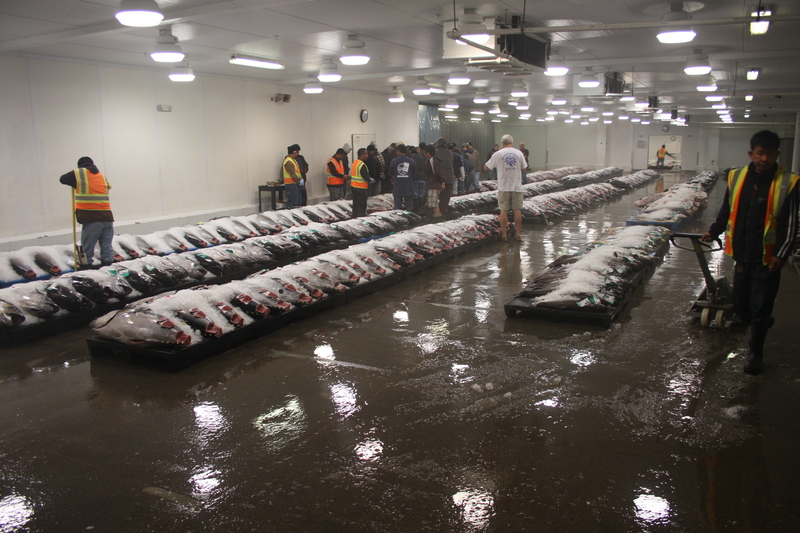 Every fish is gutted, weighed, labeled, placed on a pallet with ice, and wheeled into place. 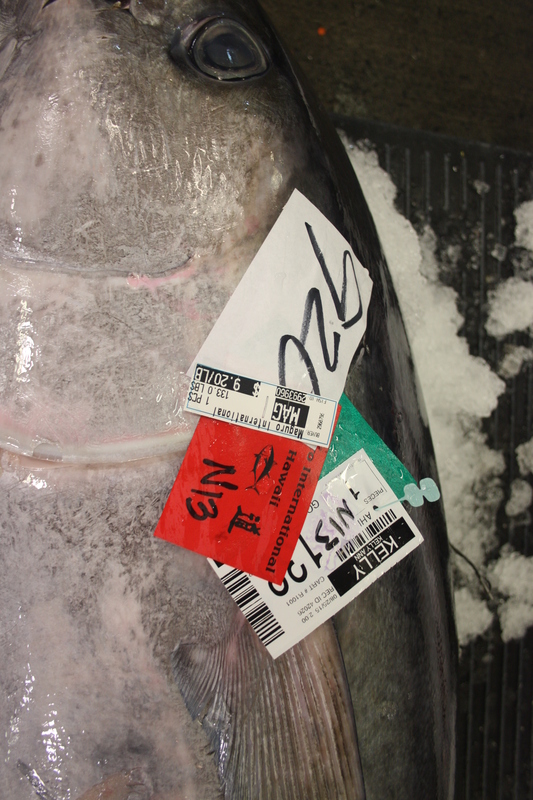 Once in place, core samples and peduncle cuts are taken from tuna and displayed to give well-seasoned buyers an indication of flesh quality. At 5:30am sharp, a brass bell is struck, and the auction begins. Surprisingly, the auctioneer does not orate in a rhythmic cadence often typical of cattle auctions. Rather, the auctioneer uses more of an interpretive dance that includes hand gestures, chin nods, eyebrow lifts, and unfamiliar words that are clearly meant for buyers who are well prepared to spend tens of thousands of dollars by the time the sun rises over Diamond Head on the horizon. 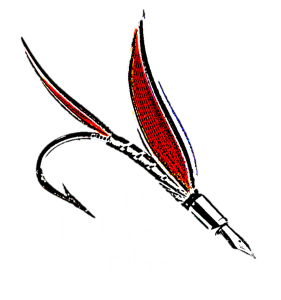 Anyone can participate, but representatives from large fish buyers make up the entire group and prevail every time. 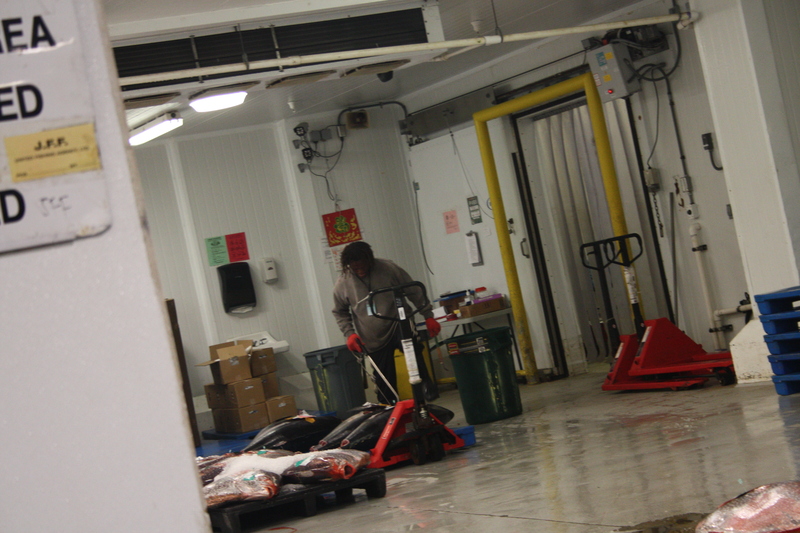 The gaggle of people play a slow game of Leap Frog down the length of the pallets of iced fish. 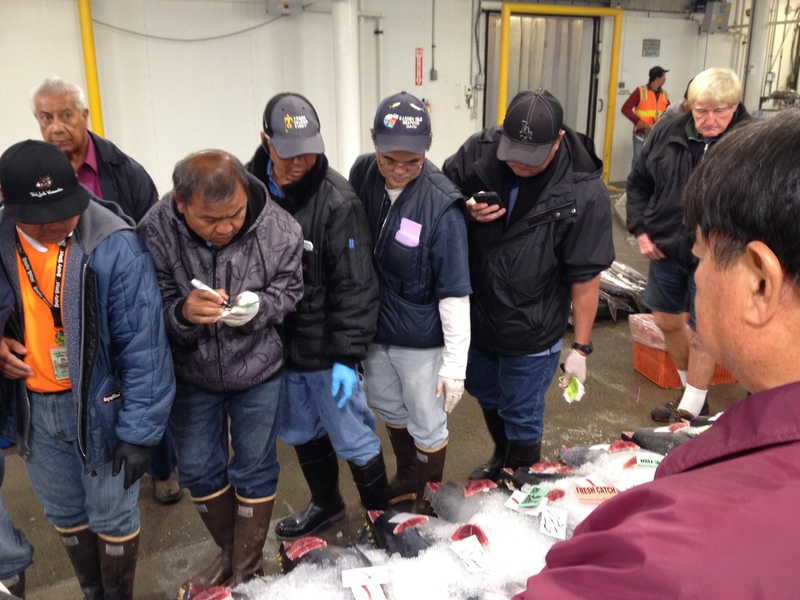 Each individual makes a calculated move to gain the best position to evaluate the flesh of each fish while also catching the eye of the auctioneer when placing a bid. Despite the grand size of the refrigerated room, all 40 people stand touching shoulder to shoulder in a very small space. The group looked reminiscent of a bunch of small children playing soccer, where everyone wants to be as close to the ball as possible. 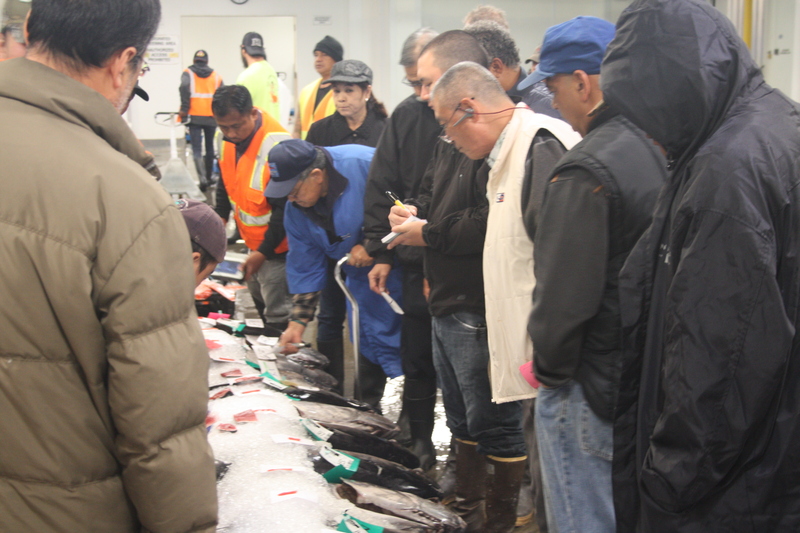 As a fish is purchased, an assistant with a grease pen writes the price per pound and the buyer’s name on a piece of paper and places it on the fish. Within seconds, the next fish is on the clock and bidding once again commences. As the group clears the area, the completed pallets are wheeled away to another room to be processed and loaded onto awaiting vehicles. 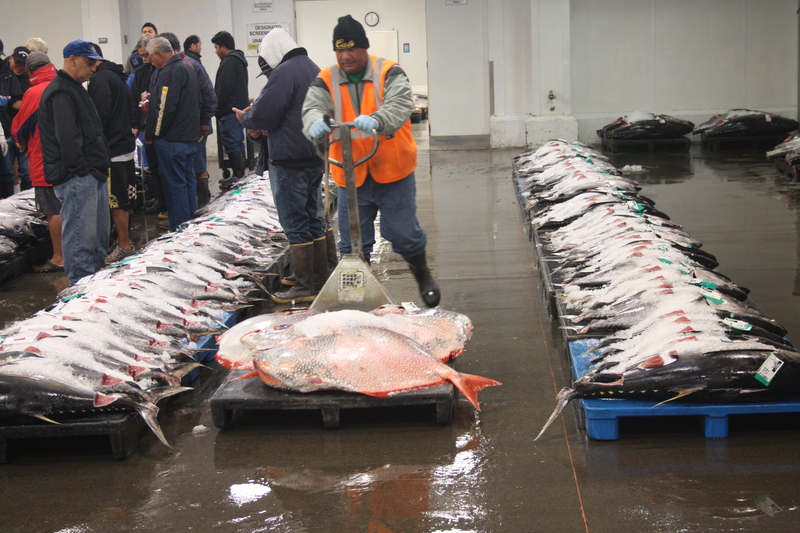 The pallet is then replaced with another group of prepared fish and awaits another pass from the group of people. The process repeats itself until all of the fish are sold. Being a visitor in this place is like being a fish out of water. Even better, it is like trying to walk down a busy “up” escalator. There are a lot of moving parts, plenty of noise, and everyone else but you appears to know exactly where to stand to go with the flow. Despite the clear inconvenience you may cause as a visitor, it is well worth the visit to witness the last tuna auction in the United States. If one decides to visit, be prepared to get there early, to wear clothes appropriate for the near freezing environment, and to not accidentally raise an eyebrow or a finger at the wrong time and end up paying more than a thousand dollars for a single fish. 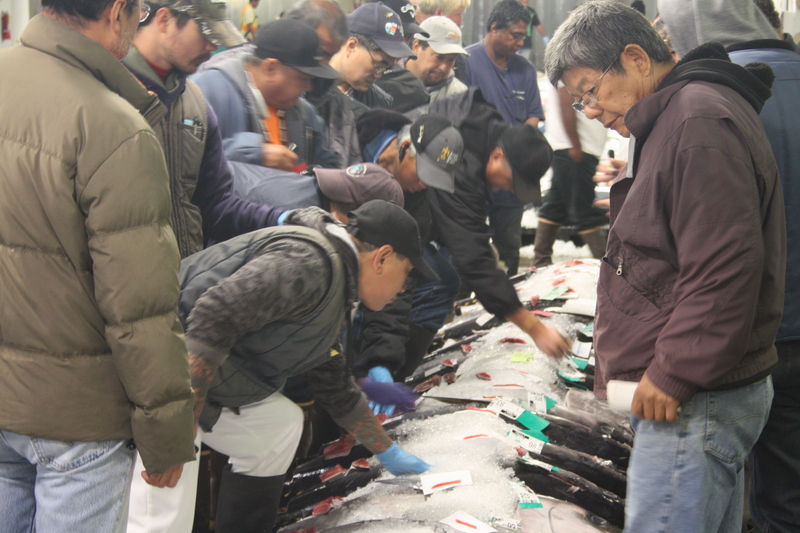 UPDATE: In September 2016, Whole Foods decided to suspend purchasing tuna from this auction house until conditions improve for boat workers that supply the auction. Read here for more information. 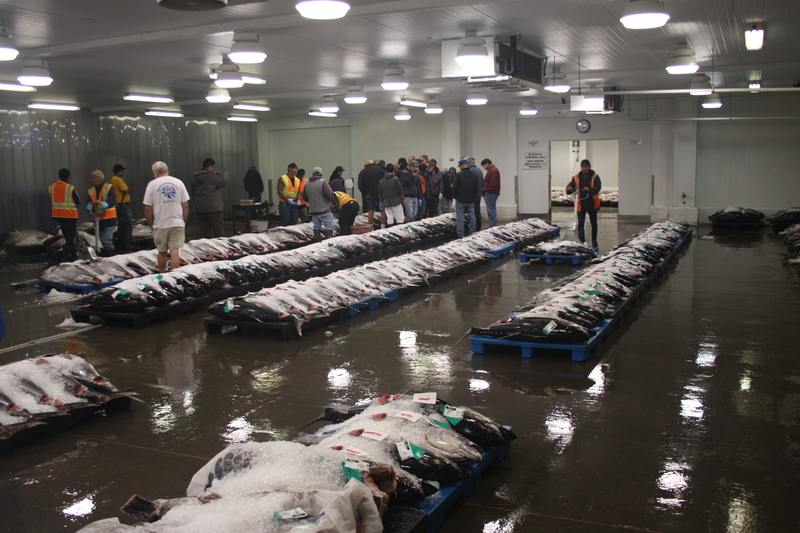 Here is a video of some boat workers offloading tuna. Once again, you’re highlighting a piece of the world I’d never heard of! Very interesting indeed. I’m curious about the purpose of the auction, from the buyers’ perspective. Are they hoping for better prices, ultra-freshness, or something else that they wouldn’t get by purchasing in another mode or venue? Great post. 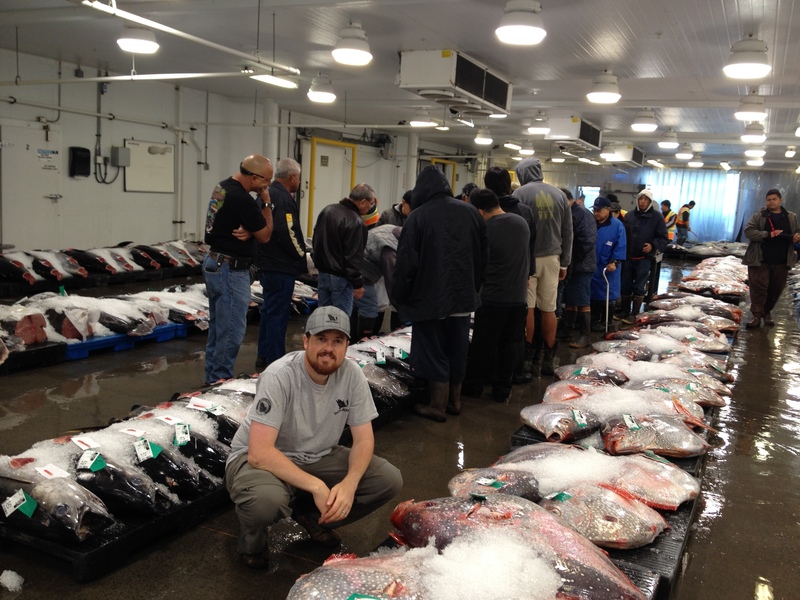 I wonder if the 133 lb fish in the intro may have been an ahi (big eye or yellowfin tuna) and not tombo ahi (albacore tuna)? 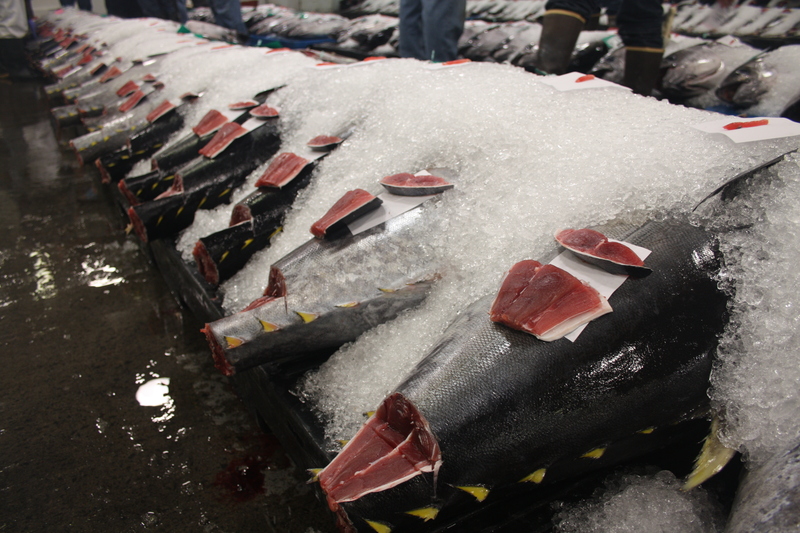 The auction sees a good number of tombo in season, but they tend to max out at about 80 lbs.